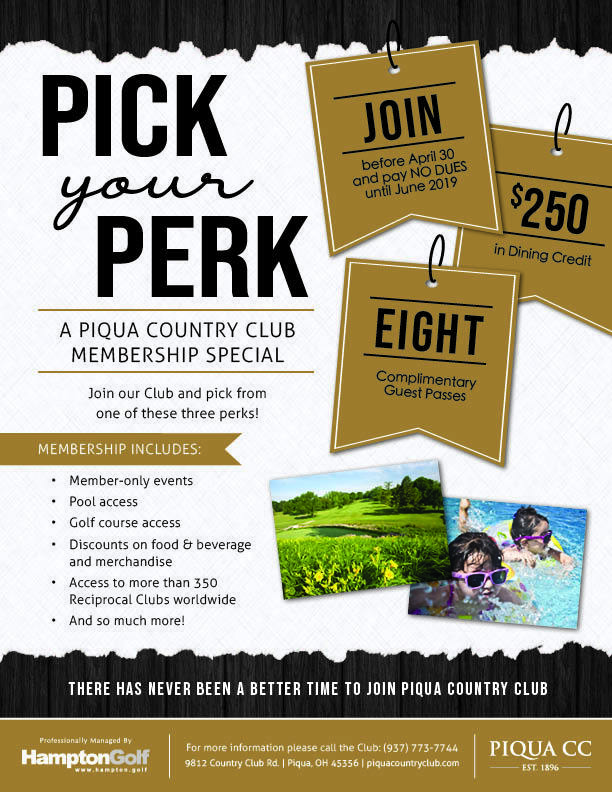 With new and exciting changes taking place, there has never been a better time to join Piqua Country Club! Members enjoy full access to Club amenities such as a professional Golf Course, large swimming pool, full bar, selection of banquet venues, and dining that features contemporary American cuisine. In addition, we offer a variety of member-specific activities and events for adults and children. Full Golf members have immediate reciprocal access to other exclusive Clubs in the Hampton Golf Network of Clubs, over 300 worldwide. Full golf members have immediate reciprocal access to other exclusive clubs in the Hampton Golf portfolio. Includes access to all club amenities including golf, dining, swimming pool and all social events for one adult. This membership applies to individuals or a couple, under the age of 40, and their children. * The Junior Full Membership includes access to all club amenities including golf, dining, swimming, kids room and all social events. The Junior Social Membership applies to individuals or a couple, under the age of 40, and their children. * This membership includes access to the swimming facility, dining venues, kids room and all social events, and programs. Junior Social Members may play up to 12 rounds of golf in a calendar year for $50 per round including cart or $30 per round walking. Associate Full Members have immediate reciprocal access to other exclusive clubs in the Hampton Golf portfolio. Includes access to dining venues and banquet facilities for unlimited signers under one monthly rate. Swimming facilities, golf, social events, and other programs are not included. All dues, food, and beverage are billed to the company. Available to companies and businesses in Piqua and surrounding areas. Full club access and tailored options are available. The membership runs from Memorial Day weekend through Labor Day weekend. Summer Pool Membership will give you access to the pool area including monthly member parties on the pool deck and much more!